The Model for Prediction Across Scales - Atmosphere (MPAS-A) adopts spherical centroidal Voronoi tessellations (SCVTs) covering the globe; local refinement is achieved using variable-resolution meshes. Currently MPAS-A uses a constant global timestep, determined by the size of the smallest mesh cell. This limits the resolution variability, as the existence of a high-resolution region would make the computational resource requirement prohibitively large. ClusterTech has relaxed this restriction by implementing an optional hierarchical time-stepping (HTS) treatment in the MPAS-A dynamic core. In this scheme, mesh cells of different sizes can use different timesteps. 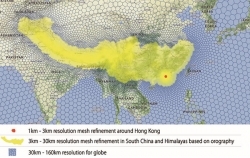 This not only reduces the required computational resources, but also enables the use of extreme variable resolution on a global mesh. The company implements a cloud-based service platform – ClusterTech Platform for Atmospheric Simulation (CPAS) – for generating user-specified meshes and to test simulations. At Meteorological Technology World Expo 2019, ClusterTech’s team will showcase results with the finest resolution regions using a grid size of 1km (0.6 miles), gradually transitioning to 160km (99 miles) resolution outside the region of interest. Local refinement regions of arbitrary shapes can be used to fit mountain ranges, coastlines and city contours. Visitors will be able to see how they can use CPAS to generate their own customized meshes.